Brilliant blue waters of McGregor Lake. 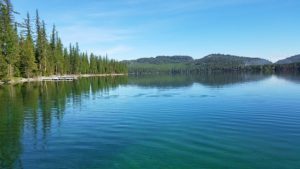 In NW Montana there are three large lakes located within 45 minutes to an hour west of Kalispell, MT. They are Ashley Lake, Bitterroot Lake , McGregor Lake and additionally a series of smaller lakes called the “Thompson Chain of Lakes”. Bitterroot Lake, McGregor Lake and Thompson Chain of Lakes have paved road access, while Ashley Lake is a little bit more of an adventure to get to having a lengthy portion of the drive on gravel county road. There is typically a reasonable selection of waterfront real estate on these lakes, thus prices have been competitive in our recent market. You can search via the map by using the “Show on Map” tab or use the Gallery tab to search each lake by price.